Sorry I haven’t posted in a while, but work has been zapping my creativity. Last week, I made a cheese grits casserole at work and people have been begging for an “at home recipe”, so here it is. 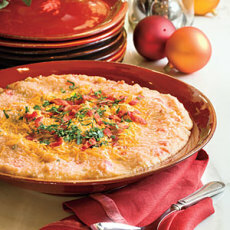 This is great as a starch with any meal, but even better when paired with a Southern meal. If you don’t think you like grits, give this a try. This IS NOT your normal breakfast style grits. In a large stock pot, bring the chicken stock and half & half to a rolling bowl. Whisk in the grits and cook, stirring constantly, for 5-7 minutes until the grits begin to thicken and bubble (be careful not to let them bubble on your hand/arms as they are like LAVA). Once thickened, remove from stove and pour grits into a mixing bowl. To the grits, add the heavy cream, melted butter, cheese, bacon crumbles, diced tomato and the corn. Stir well to combine. Pour grits into a lightly greased casserole dish and bake at 350F for 10 minutes. One thing my customers are always saying is that I make some of the best bread pudding they’ve ever eaten. 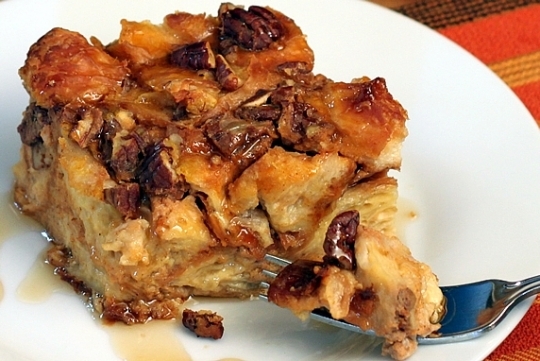 I have several variations on bread pudding and try to make a pan about once a week. Blueberry, chocolate, orange-cranberry, traditional… I make whatever based on what I’ve got in the coolers and pantry. Recently we had some croissants that were turning stale and I needed to use them. Since I’m not a true “baker”, I’ll usually look online for a recipe idea and then take off on it, because I hate following a recipe. This recipe started the same way, but because I’ve had a bumper crop of pecans from the home tree this year, I’m also looking at ways to use them in my fall cooking. 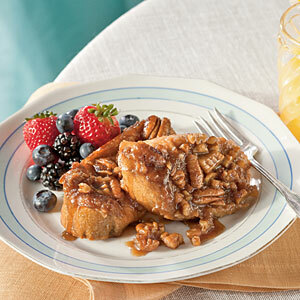 This recipe can be made as a dessert or as a breakfast/brunch bread pudding. If you’re making it for the later, simply mix it up and refrigerate overnight, then bake off when you wake up. In a large mixing bowl, lightly beat the eggs, sugars, salt and vanilla extract. Fold in the pumpkin, then add the half & half and milk. Add the cubed croissants and toss well to incorporate. The mixture should be slightly soupy and if needed, add a little more milk. For a breakfast/brunch serving, simply top with pure maple syrup. If you’re serving as a dessert, mix 1 box of powdered sugar with 1/4 cup fresh squeezed orange juice and top by dipping a wire whisk into the sugar glaze and lightly shaking it over the surface. For the past few years, we have served a variety of fresh baked muffins at work and my customers have grown accustomed to a nice hot muffin. Like many foodservice establishments, we cheated. Our muffins were fresh baked, but not fresh made. We bought muffin batter that you “scooped and baked” to save time (and labor costs). Customers loved them, so it was a win-win situation. Things changed when I switched companies recently. I had the same customers looking for their usual breakfast muffins, but our new grocery supplier offered a “less than favorable” alternative for muffin batter. My customers have not been happy, so I promised them I would make some scratch muffin batter this weekend to serve this coming week in the cafe. Since baking is not my thing (I love to cook but I DESPISE following recipes), I had to scour magazines and internet recipes to try and find something I felt was comparable to what my customers are expecting tomorrow morning. This recipe is a tweak; I started with a basic muffin recipe and made it my own. They turned out delicious, so I thought I’d share with you this extremely easy recipe for making homemade muffins. 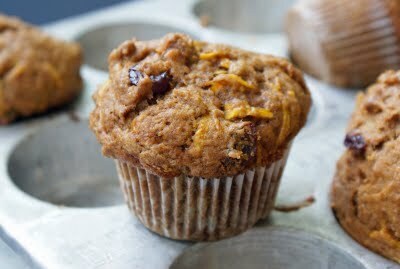 You can use this recipe for for a variety of muffins by substituting the flavorful ingredients. In fact, I used the basic part of this recipe (as noted below) to create 5 varieties of muffins for breakfast tomorrow (Glorious Morning, Chocolate Chip, Blueberry, Banana Nut and Cranberry-Orange-Almond). I’m sharing the whole recipe for the Glorious Morning muffins which are by far my biggest seller, but noting where you can substitute to make other varieties. There’s no need to buy muffin mix in a bag or box when most all these ingredients can be found in most of your pantries! Give them a shot! The good thing is, you can mix them up on Friday evening and refrigerate the batter. Then scoop into your muffin tins and bake Saturday morning! In the bowl of a mixer, combine the sour cream, eggs, sugar and vanilla and mix for 30 seconds. In a mixing bowl, combine the flour, baking powder, soda and cinnamon and mix to incorporate (I use a wire whisk to mix dry ingredients). 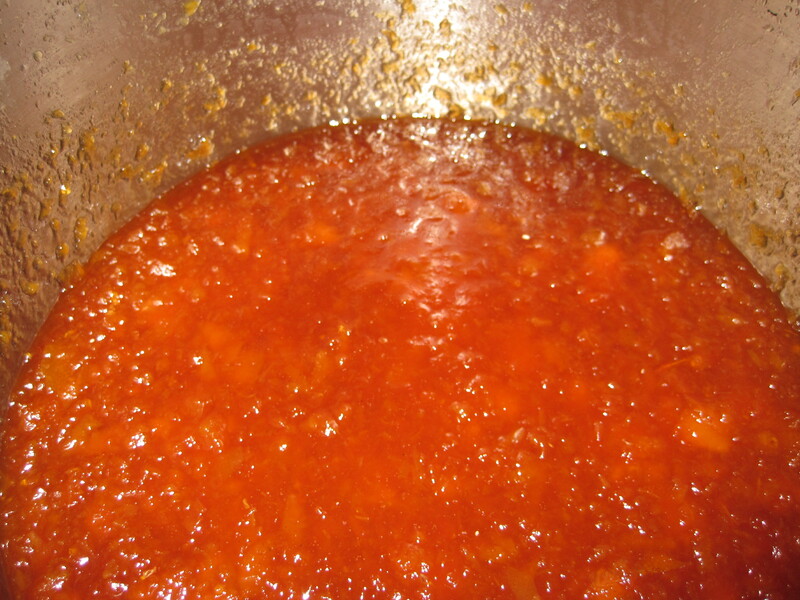 Add the dry ingredients to the wet in the mixer and run on low just long enough to incorporate into a batter. That’s your basic muffin mix. If you wanted to make blueberry, to the batter add some fresh or thawed, frozen blueberries and add the orange marmalade. 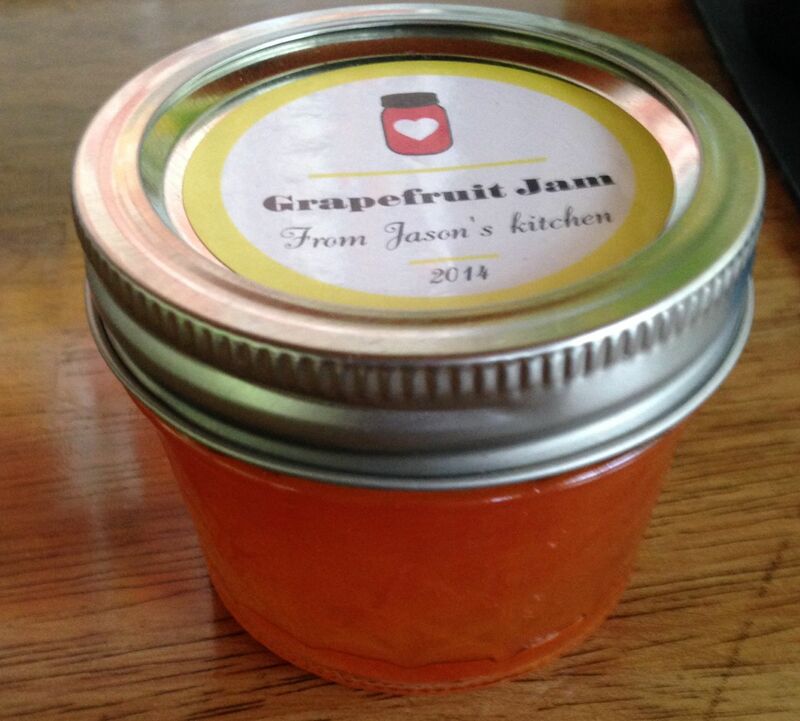 For cranberry-orange-almond, use dried cranberries, sliced almonds and orange marmalade. For banana nut, I use crushed pecans and 2 overly ripe bananas, smashed up with your hands or run through the food processor. For chocolate chip, just add chocolate chip morsels straight from the bag. Scoop muffin mix into a 12 muffin tin pan or 6 jumbo muffin pan. Bake at 325F for 18-25 minutes (depending on the size, less time for smaller muffins, more for larger) or until brown and a toothpick inserted comes out clean. About this time of year, anyone with a back yard garden is looking for creative ideas to use up the abundance of zucchini, fresh tomatoes and herbs. Here’s a wonderful Saturday morning recipe for breakfast casserole, loaded with color straight from the back yard and a perfect recipe for a brunch. 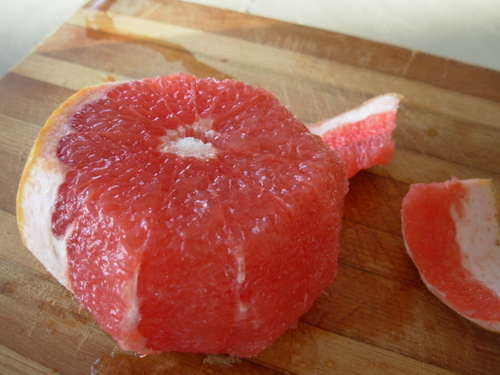 This makes for 12 servings, so cut it down as needed for a smaller family. In a saute pan, cook the bacon and onion until the onion is tender and the bacon has browned. 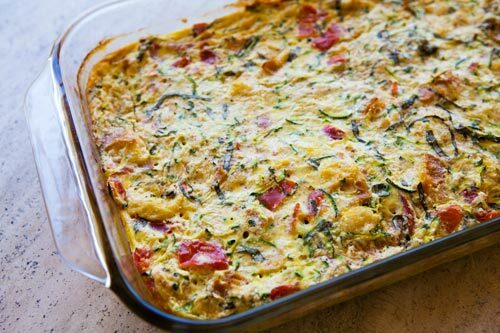 In a large mixing bowl, combine the hashbrown potatoes, zucchini and tomatoes and toss well. Add the bacon and onions along with the pan drippings to the potato-vegetable mixture, then mix in the cheeses, Tabasco, beaten eggs and the fresh basil. Spoon mixture into a 9″x13″ glass baking dish sprayed lightly with PAM. At this point I usually salt and pepper the top of the casserole as well. Bake in a 350F oven for 35-40 minutes, until casserole has “set” and is just beginning to brown. Serves 12 but can easily be cut down to 6 or 4 by equally dividing the ingredients. This morning I decided to make a dish I would make from time to time at The News for my customers. This is a really simply, but delicious (and rich/fattening) dish that is obviously great at breakfast but works well for a brunch also. You basically put the casserole together, stick it in the frig overnight and then slide into the oven when you wake up. This morning, we had our toast with some fresh strawberries and cafe au lait. Give it a shot! Kids love it, adults love it.. you can’t go wrong. In a 13×9 glass baking dish, start with melted butter, then add the dark brown sugar, spreading evenly over the bottom of the dish. Top the sugar with the pecans and drizzle the pecans with the maple syrup. Next, arrange the bread slices on top of the pecans. In a mixing bowl, combine the beaten eggs, half & half, sugar, cinnamon and vanilla extract. Blend well, then pour over the bread slices. Cover the dish with plastic wrap and refrigerate overnight. To cook and serve, remove the casserole from the frig and let it warm up while the oven is preheating to 350F. Uncover and bake the casserole for approximately 30 minutes, until golden brown. Serve with a spatula, by flipping the slices onto your plate, so all the praline mix at the bottom ends up on top of your toast. 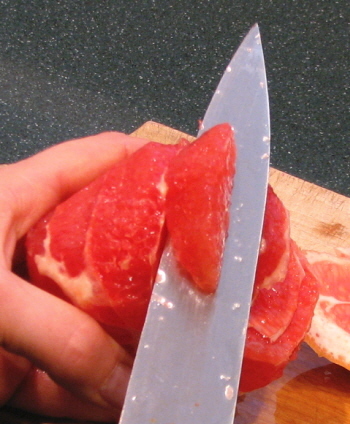 Garnish with fresh fruit. If desired, sprinkle with powdered sugar.